Satan is vicious. 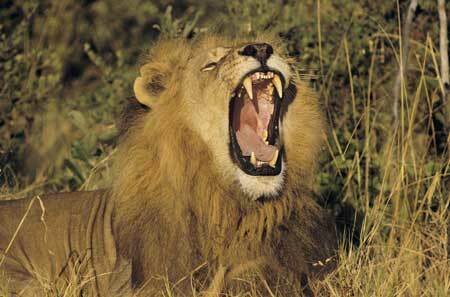 He roams like a roaring lion seeking someone to devour (I Peter 5:8). Just like we wouldn’t go on a safari in lion infested territory without preparation, we need to prepare to face Satan’s attacks. We have already learned we begin with Repentance and Confession. In this post, we need to see the place of Bible Study and Prayer. We all know Psalm 119:11. “I have stored up your word in my heart, that I might not sin against you” (ESV). Clearly, if we want to avoid sin, we must spend time in Bible Study. We do this to know what sin is. We can’t even accomplish the Confession we have already discussed if we do not learn the mind of God through His revelation (cf. I Corinthians 2:11-12). Consider Matthew 4:1-11. Even Jesus overcame sin because of what was written. He knew what was sin and He knew how to respond when Satan attacked because He had stored up God’s word in His heart. We also need to study God’s word to learn Satan’s attacks. II Corinthians 2:11 speaks of knowing Satan’s designs so we won’t be outwitted by him. From Eve to Peter, through Bible study we see how Satan tempted others. Learning how he attacks prepares us and helps us respond well. At the same time, we need to develop a healthy habit of Prayer. No doubt, we will need to pray in the moment of temptation. The only way to be strong enough to pray in the moment of temptation is if we have developed a strong habit of prayer when we weren’t being tempted. Consider the example of Daniel in Daniel 6:10. Daniel was able to keep praying when it was illegal because it was what he had done previously. Prayer was his ingrained response. We must remember our battle is not against flesh and blood, but against powers too great for us (cf. Ephesians 6:10-13). We can’t win this battle. But God can. Therefore, we need to develop a healthy relationship with God through prayer. As Ephesians 3:20 says, God can do far more abundantly than we ask by the power working through us. However, this means we have to ask. Further, as the model prayer demonstrates in Matthew 6:13, God is able to keep us from and deliver us through temptation. How many temptations might we avoid in our lives if we simply make this prayer a habit even when we aren’t being tempted? What is your plan for study and prayer this week? Schedule it out and then make sure to fit it in. Don’t do this to check it off your Christian living list, but because this is what works. This is what will help you overcome those temptations. “I can overcome anything except temptation.” An overly used one-liner and yet overly used because it is overly true. It certainly has been overly true in my life. With that in mind, I want to share with you what helps me face the daily battle, what helps me prepare for Satan’s attacks. This is the first part in what looks like will be a four part series on how to prepare for temptation. Of course, who knows what I might learn over the next several days that gets added in. I hope it helps. Regrettably, the “Just Say No” tactic that sounds so good in the safety of our assemblies doesn’t always hold water when we are face to face with Satan’s weapons on the battlefield. We need some real help to overcome temptation. What should we do? Like any battle, without preparation, we will fall. There are several things we must do to prepare; in this article, I want to share two—Repentance and Confession. The first thing we have to do is Repent. II Corinthians 7:10 says, “For godly grief produces a repentance that leads to salvation without regret…” (ESV). We have already sinned (Romans 3:23). This isn’t about getting perfect people to stay perfect, but helping sinful people avoid future sin. Without repentance, the battle is already lost. Repentance is a change of mind leading to a change of action. If we still think some sin is alright, not that bad, not a big deal, a social faux pas, a mistake or any other mitigated concept, change of action will not take place. Only when we mourn our actions and change our minds will we overcome temptation. As long as I believe there’s not really anything wrong with having bitterness, wrath or clamor toward my wife and kids, I will not stop. Oh, I may white-knuckle it for a while to please other people, but it will always creep back in. I must rethink my sins and see how bad they really are. At the same time, I also need to Confess. I John 1:9 says if we confess our sins, God will forgive us. Forgiveness is a prerequisite to salvation, but that is not why I bring it up. Confession literally means to say the same thing as. In spiritual things, it means to say the same thing as God about something. Thus, confessing my sins to God is not merely admitting I sinned. Confessing means verbalizing exactly what God thinks about the sin. If I want to overcome sin in the future, I have to get God’s view of something entrenched in my head. I have to see it the way God sees it. I have to speak about it the way God speaks about it. When I confess my sins to God, I’m agreeing with Him. I am communing with His mind. I am connecting with His thoughts and ways. The point is not that we have to hit a checklist of confession for each sin to be saved. The point is working through the exercise of seeing what God sees and thinking like God thinks is necessary if I want to live God’s way. If I don’t repent of and confess my sins, I won’t make it when the temptation hits again. So let’s start here. Be honest. What are your sins? What does God say about them? What are you going to say about them? Feel free to write out the list and work through them one by one. God will help. God will forgive. You will grow.